Our friends at efabless are hosting a series of challenges over the coming weeks and months where you can design your own semiconductor chip in just a few hours. You don’t need to know anything about semiconductor design. They guide you through the whole process and the result is your very own chip that you could then use in your PCB designs. You can see the contests here. Introducing the future of electronic product design. And it’s free. I have some very exciting news: We’ve been acquired by Altium, a leading provider of design software for the electronics industry. Our mission at Upverter from the very start has been to make hardware and product design approachable for everyone: to make hardware less hard. To empower engineers, makers, hobbyists and students by equipping them with world-class technology through an intuitive user experience. We believe the best design tools fade into the background, freeing designers to be truly creative. And over the past seven years we’ve gotten really close to realizing this vision. We’ve built the world’s most sophisticated cloud-based, collaborative hardware design tool. We’ve helped more than 45,000 people design more than 80 thousand devices. But we’re not even close to finished yet. Altium shares our vision for a powerful, collaborative new style of product design software. Free, but powerful enough to design a real product, accessible-to-all, cloud-based and collaborative, and maybe, most importantly, incredibly intuitive, helpful even, and easy-to-use. If the world is going to design millions of new IOT devices over the next decade then it needs a new style of design software. These devices won’t come from the CAD world. Their tools are unapproachable, they feel old, and they were made for a different reason – made for professional, trained, and experienced electrical engineers. These devices need a different approach – they need product design software made for everyone else. A new style of design software made for the new generation. Made for the masses. You may have noticed that today we removed our paid professional account tier. From now on the best, most feature-full, most powerful version of Upverter will be our only version. It will always be free to use, for everyone, from anywhere. Regardless of whether you’re a professional electrical engineer, a maker, a student, a hobbyist or anyone else, you can now design your product, your hardware, your IOT device, your PCB – completely for free using Upverter. Unfettered access for all. I want to emphasize that we aren’t making Upverter free for the sake of free, and we aren’t making Upverter free because Altium doesn’t care about it. It’s exactly the the opposite. We believe that this new style of design platform is so valuable, and so necessary, that making it anything other than free would hurt the world, limit our growth, and prevent our vision from being realized. Between Octopart, which provides free electronic component search and discovery (joined Altium in 2015) and our experiments with EEConcierge, which provides paid design services on-demand, inside your design tool (think of it as in-app purchases), we have come to the conclusion that indirect monetization is the future. We think it’s the right way to both make money, and help designers produce products – without getting in their way or limiting them – and we’re betting on it going forward. The team that built Upverter: Steve, Mike, Francesca, Carmen, Ryan, Patryk, Yashwanth and me – the entire team – have joined Altium, and we’re continuing to work on Upverter in the hopes of making it so much better. We’re going to be growing our team too, investing even more into making Upverter both incredibly powerful, and also incredibly easy to use. 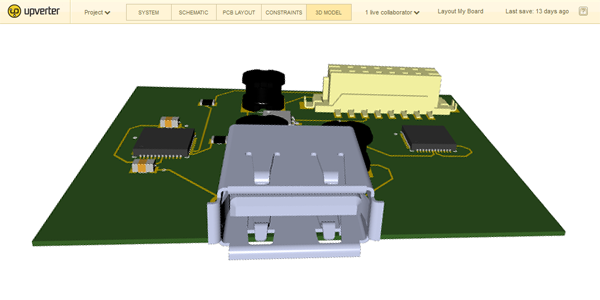 We have a grand vision of making it possible for our users to design more than just a PCB – a complete product: system design, schematic, PCB, enclosure, mechanical, firmware, software, BOM, manufacturing, etc, etc. Soup to nuts. All through Upverter. All collaborative. All easy to use. Unified product design. We’re joining forces with Altium because we think we can move faster, innovate faster, and grow faster together than we could apart. The most important thing is a world filled with thousands, and thousands of new IOT devices and products – and that you bring your product to life. We’re partnering with Altium because it enables us, to enable you, to make that world a reality – better than we ever could on our own. Thanks for all of your support over the years. Your feedback, your trust, your amazing projects, and your love fuelled us. We got here together – and we’re so deeply grateful for that. I’m excited to open this new chapter with you – we’re going to do so many remarkable things together over the next few years. Upverter just launched a new product. It’s called EE Concierge. If you’re a hardware engineer and you don’t use Upverter to design your PCBs you should check it out. Upverter is the same professional, collaborative, cloud-based design tool you know and love except more so. We’ve made our free plan even better than before, and added even more professional layout and 3D features – more on this soon. 17 months ago we began an experiment within the Upverter editor to make sure that every single part a user ever needed, every part they ever searched for, and every part they ever used existed in the Upverter parts library. At the time we thought it would help us get users to adopt Upverter as their preferred EDA tool. You can read more about our early experiments, and why we built the concierge here. We’ve since realized that the concierge is so much more than a way to convert engineers into Upverter users. It turns out that most engineers hate making parts. It doesn’t matter what tool they use, where they work or what industry they’re in – making symbols, making footprints, modelling parts in 3D and copying attribute data out of PDF datasheets is tedious. It’s slow, painful and error prone. 75% of manufacturing problems are a result of mistakes by engineers who should be designing, instead of making parts. We built a new product for these engineers. For engineers that don’t want to make parts, but can’t or don’t want to switch to Upverter; engineers that have better things to do, engineers that can’t afford manufacturing errors because they made parts themselves. We call it EE Concierge. The Electrical Engineering Concierge Service. And we’re here to help you with any electrical engineering task that you need help with, starting with making your parts for you. The big difference between this new product and other online part libraries is that you can trust it. When we started the parts concierge for Upverter users we decided that it wasn’t enough to just give people questionable data. No true professional would ever use a random part off the internet – they’d rather make it from scratch and be sure it was going to work. So for the parts concierge to work, we knew the parts had to be perfect – perfect attributes, symbol, footprint, pricing, and they would need to come with a 3D model. It’s a very hard problem to convert PDF datasheets into CAD symbols, footprints, attributes, and 3D models reliably. Especially if people are involved. To address this, we built a massive distributed team of electrical engineers, and software to split up tasks and spread them around the world. These electrical engineers all work on the same parts together collaboratively using the Upverter toolset and our amazing crowd-sourced design rules. Their data is compared, and checked and improved to eventually produce a winner, or if a winner is not produced, we request more samples from more and more electrical engineers until we are confident the data is correct. We then pass all this data through a machine intelligence to verify if the part is correct. This is the only way you can reliably make the highest quality parts in huge volume and still trust that the data is correct. This is our first secret weapon. You can see an example of our quality by downloading our example library here. We store all of this parts data in a common format that we’ve been developing over the years at Upverter. This common format is our second secret weapon. It allows us to build intelligent export configuration and translation tools so that the users of EE Concierge can configure their parts library to export in exactly the same style as parts they make internally. One of the first steps to using EE Concierge is to provide us with your internal hardware team style guide, so that we can help you setup your export to be exactly the same as the parts you make manually. You can see our Style Guide and all the many configuration options here. Finally we’ve built a sophisticated pricing algorithm so that you get charged a fair price for every part you request through the concierge. We think it’s crazy to pay the same price for a resistor that you’d pay for a 2500 pin BGA. That’s why our algorithm is based on the complexity of the part – not one price to rule them all, not how long it took us to make it, or how many parts specialists needed to be involved, or anything like that. You pay an algorithmic, deterministic fair price based on the complexity of the part we made for you. Resistors are cheaper than BGAs, and parts that can be generated with our software are cheaper than non-standard connectors that we need to draw by hand. You can see example pricing on the pricing page of the EE Concierge site. Finally, I want to tell you about a special promotion we’re doing right now. For a limited time, if you sign up for EE Concierge we will give you an Example Library of parts worth more than $1500 and an additional $150 in request credit that you can use to request any parts that you want from the concierge – all for free. This is enough credit for 5 or more average sized parts, so you can truly test our capability, quality, performance, and turnaround time. As always if you have any suggestions, feedback, or questions please comment here, or in the Upverter forum, or email me at zak@eeconcierge.com. You can now export your projects as 3D Model Step files to visualize your projects sooner. Head over to the project page and find the 3D Model (Step) option under the downloads section. You can also preview your project while you work. Switch over to the 3D Model tool in the editor to pan over and zoom into your project in all of its 3D glory. This is the first of the new Upverter 4.0 features going live this week. Check it out! We’ve been a bit quiet for the past few months here at Upverter while we’ve been working on version 4. My apologies for that. We are alive and well. In fact the business side of Upverter is performing the best it has ever performed. Our key metrics are strong, we’re growing, and we’re (finally) making money. Version 4 is finally, almost, just-about, ready to launch. You’ll see the first of the new features go live in the product this week, and then continue to trickle out over the coming weeks. If you’ve ever signed up for an account with an email address, or are on our mailing list, or follow the Upverter forum we will notify you there too. I’m pretty excited about all the new features, and some of the new super powers we’re giving engineers using Upverter. But I’m even more excited about a change we made in our thinking about a year ago. We decided that we couldn’t convert every engineer from using legacy desktop software like Cadence or Altium, into Upverter overnight. That it was going to take time. And that we needed to stop alienating these users and instead make it easier for them to participate in the Upverter community, and to benefit from the Upverter marketplace today. And so as part of the Upverter version 4 launch we will, also for the first time ever, release a set of plugins that give Upverter’s super powers to users of desktop ecad software. Now anyone can be an Upverter user, without needing to switch software. Stay tuned! And sorry again for the silence.